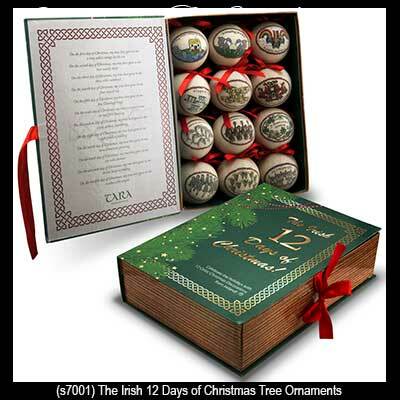 These Irish ornaments represent the 12 days of Christmas with this boxed set. The cost per ornament is only $3.33 each! Sorry, these Christmas ornaments are now sold out. 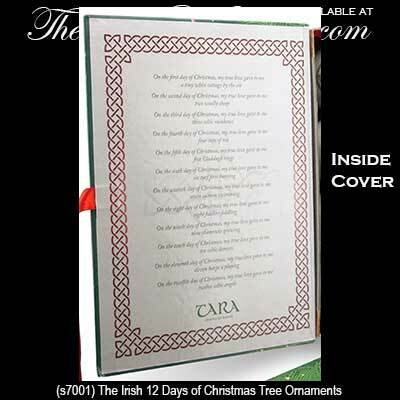 These Irish Christmas ornaments feature the following verse on the inside cover of the presentation box. The Irish 12 Days of Christmas ornaments are shatterproof baubles that are received in a presentation keepsake book shaped box that is decorated with Celtic knot-work. 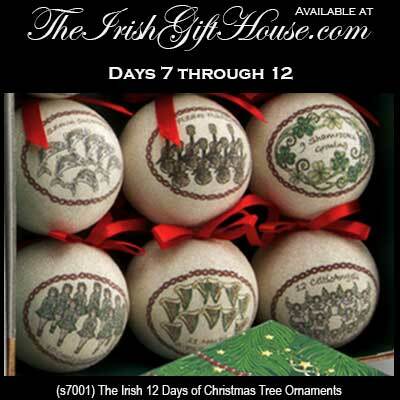 Each of the 12 ornaments features an Irish version of The 12 Days of Christmas; they measure just under 3" wide and have an included red ribbon for hanging. The presentation box measures 12 1/4" x 9 1/4" x 3" and it is complete with history cards for Celtic knots, Claddagh and shamrock that are complements of The Irish Gift House. These Irish Christmas ornaments are rafted in Ireland by Tara.